The power of a wish combines with magical moments from cherished Disney films and dazzling pyrotechnic effects to create "Wishes," the biggest, boldest fireworks show ever presented for Magic Kingdom guests at Walt Disney World Resort. Narrated by Jiminy Cricket, who memorably served as Pinocchio's conscience in Disney's animated masterpiece, the new story-in-the-sky spectacular tells a thrilling, heart-tugging story about making a wish come true. "I bet a lot of you folks don't believe that -- about a wish coming true, do ya?" Jiminy says as the 12-minute spectacle begins. "Well, I didn't either. Of course, I'm just a cricket, but let me tell ya what changed my mind. Ya see, the most fantastic, magical things can happen -- and it all starts with a wish!" At several times the size of "Fantasy in the Sky," Magic Kingdom's previous fireworks show, "Wishes" takes guests through treasured tales of adventure and romance from classic Disney films, accompanied by brilliant bursts of color and light above -- and around -- Cinderella Castle. Guests will discover excellent viewing locations all throughout the theme park. 'Wishes' takes us into the heart of Disney storytelling and shows us that wishes can come true if you believe in them with all your heart. The show will move guests in a very special way, filling them with a magic that only Disney can create. 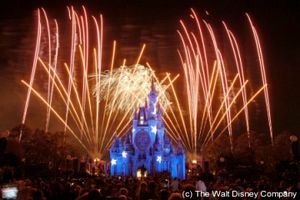 The story of "Wishes" blends classic Disney songs and character voices with pyrotechnic effects never seen before in a Disney theme park, including several new sites for launching fireworks that create moments both breathtaking and intimate. While "Wishes" replaces "Fantasy in the Sky," which premiered in the 1970s, one fondly remembered element remains -- a certain mischievous pixie who flies high above Magic Kingdom to demonstrate the power of believing in a wish. "Wishes" is presented most nights at Magic Kingdom. The best places to stand are where you get a clear view of the Castle, as the fireworks are based around it. Main Street is an excellent spot. The bridge from the Hub to Tomorrowland (Tinker Bell will fly right over you). The bridge from the Hub to Liberty Square. In front of the Crystal Palace. The fireworks can also be viewed from the beaches at the Polynesian Resort, Grand Floridian Resort, and from the 4th floor of the Contemporary Resort. Take a fireworks cruise on a pontoon boat or the Grand 1 Yacht. "Wishes" is several times larger than "Fantasy in the Sky," the previous fireworks show at Magic Kingdom, and roughly five minutes longer. Guests may remain in wheelchairs and ECVs. The lights on Main Street are turned off during the show making it quite dark.